A line that has been used to help little ones cope with the number of cheerios dispensed, and color of construction paper received, stabbed me in the gut. I know what my 3 year old misses. He wants that family unit again. He wants to live under the same roof with mommy, daddy, and brother full-time. He doesn’t want to be shuffled around because of a 50-50 custody schedule. He doesn’t want the 2-2-3 transient home life that he has been dealt. For him, it doesn’t matter who he is with right now…nothing feels whole. 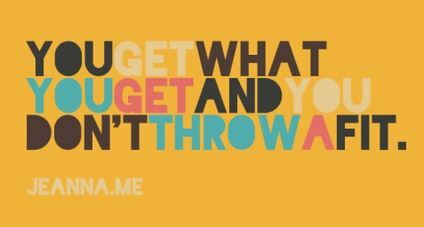 I truly wish that it was as simple as “you get what you get and you don’t throw a fit”. I’m sure that many people insist that is exactly what I should do. So I am trying to make this as simple as I can for little loving hearts. I can’t explain what’s been forgiven. I can’t even broach the subject of “Why?” with their little minds. I can’t just fix it. I can give them hope. I can ask them to tell me what is different now—and what is better now. I can show them consistency in my love, affection, and routines. I can show them my values and model behavior that I expect them to exhibit. I can show them patience when they lose theirs. I can show them how we are to love one another. I learned that I should not let my child’s meltdown keep them from attending children’s ministry; even if that means that I have to hold their hand the whole time. The love poured out over those children, and the questions asked by adults as they wonder “Am I doing this right?” resonated with me like no other experience could. It was exactly what was needed in that moment. Stitch: This is my family. I found it, all on my own. Is little, and broken, but still good. Ya. Still good.